Hillsboro baseball coach Luke Moore enters his second season with expectations to improve on last season’s 6-16 record. A year ago, Moore accepted an invitation relatively late in the process to coach the combined Hills­boro/Peabody-Burns team. Moore sees a huge advantage with a full season of coaching experience under his belt, plus a positive summer baseball experience with a county-wide team. “It’s crazy how much difference a year makes in terms of confidence—just the comfort level of the guys about (the coaching staff) and what we’re trying to do,” he said. “I love it, it’s a lot of fun. 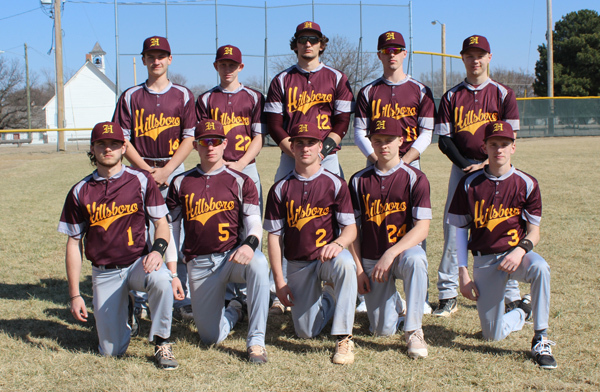 I can’t believe I’m going to talk about Hillsboro baseball when I was playing only six or seven years ago,” Moore said. “I’ve got to pinch myself sometimes. Last year’s pitching staff combined for a 7.21 earned-run average, and Moore believes his new pitching corps can improve on that mark with seasoned senior Kaden Kleiner (5.75 ERA) returning. The Trojan coach sees Jorge Hanschu as his No. 2 starter, who is back after injuring his knee in the final game of last season. Rounding out his four-pitcher starting rotation are Bryant Young, who registering a 0.75 ERA in six appearances in 2017, and Jack Parks (4.90 ERA). Moore will call in position players as needed to serve as relief pitchers. Among the relief options are Caleb Potucek, Jacob Funk, Brooks Gardner, Hunter Hein and Landon Roberts. Anchoring the defense behind the plate is a group of potential candidates led by Hanschu, Gardner and possibly Roberts. Jacob Funk will be the team’s primary first baseman. The 6-foot-4 senior received all-league honorable mention at first base in 2017. He hit .281 with 18 hits in 64 at-bats. He scored eight runs and drove in 11. Young, a .256 hitter last season, is projected to be the starter at second base, with Hunter Hein, Parks or Roberts stepping in as needed. Kleiner, when he’s not on the mound, will help fill the void created at shortstop following the graduation of Braden Vogt, a CKL second-team all-leaguer. Potucek, Roberts and Hein may see time there, too. Gardner will play third base as he continues to heal from a collarbone injury, with Potucek, Parks, Roberts and Hein ready in the wings. Among the candidates for outfield are Kleiner, Hein, Parks, Elliot and Gardner. If Moore’s lineup seems somewhat fluid, it is by intention. Moore said the biggest benefit from the summer team was to see what it takes to learn to be a winner. He credited the involvement of Marion High School players who were members of the Warriors’ state runner-up team last spring. As he looks to league play, Moore said the first five doubleheaders on the schedule happen to be against what he considers to be the top five teams in the Central Kansas League: Nickerson, Larned, Hoi­sing­ton, Haven and Pratt. The remaining regular-schedule includes Lyons, Kingman, Hal­stead, Hesston and Smoky Valley. The Swathers will be fielding a baseball team for the first time. Moore acknowledges the early-season challenge, but he is hopeful his team could sport a .500 record by the end of the regular season. “That’s realistically possible for us,” he said. The Trojans were scheduled to open the season March 27 at home against the Panthers from Nicker­son. The team will be hosting Larned April 3 beginning at 4 p.m. at Memorial Field.